2018 is here. The year in which I pledge to restart my blogging. See you in the pages next year. One of my pet peeves in Mongolia: the chronic, incessant, all-around spitting. Mongolians spit everywhere, all the time. They also blow their noses too; just hock a loogie out in the middle of the street in broad daylight. As if stuck in an impossible situation where spitting it out onto the sidewalk was the only choice left for them to stay alive. They spit with passion and noise that seem to express a deep hatred of their salivatory gland secretions. Rid of it, we must be at the soonest, as with a bad one-night-stand, and hurriedly walk away never to think of it again. The way you would spit out a fly that accidentally flew into your mouth. Your mouth that was for some reason wide open, as you ran at full speed, to let a fly in. So there you are, sputtering like a clogged engine, leaving DNA traces of yourself around the city like a dog in heat. There is such a deep hatred of saliva that drivers will stop their cars in the middle of traffic to deal with this problem right there. Sometimes you have to be careful to dodge the spit, as the person walking in front of you might let one loose without a warning or a noticeable pause in his/her stride. Just a casual, matter-of-fact, speedy trajectory of bodily fluids from his/her face, only a step ahead of you. Pray that you are not walking downwind from the spraying. I am ready to wager on the fact that the frozen spit cakes around the city lead to a few injuries in the winter. Next time you walk the streets of UB in the winter, look carefully for a few seconds at the street surface. The streets are patterned with spit-spots that will evaporate in the spring. Evaporate and most definitely enter your lungs. As someone working in the teething advertising industry in Mongolia, I get tasked to do a lot of thinking about Mongolians and their attitude towards and perception of various items from money, smartphone usage, drinking habits, attitude towards friendship etc. Y&R Asia along with its regional network offices carries out a survey of some 30,000 people from all around Asia, called GenerationAsia, that brings about some very interesting insights about the new generation of Asians. Mongolia is not yet included in the GenAsia report, but will soon be. In the meantime, I refer to the findings of the report and sit around thinking if the same applies to Mongolians. Do the youth in Mongolia place as much importance on their passions as those in Shanghai or Tokyo? Certainly the world has become a much smaller, a lot more uniform place than it used to be. Mongolia is not some exotic nomadic and isolated country where deel-clad people ride around on horses drunk on fermented horse milk anymore. We are a country where deel-clad people ride in Hummers and Priuses, drunk on fermented horse milk and locally-brewed beer, all the while taking selfies and welfies on unlocked iPhone6's. Mind you, thanks to the new, much stricter traffic law introduced by the Government on September 1st, we should hopefully see a sharp decline in drink-driving. And jaywalking, which, really, is no different from walking in Mongolia at the moment. I digress. I am left wondering if the world has become a more boring place because of technology. The elements of surprise and spontaneity are denied to us thanks to our modern constantly-connected lifestyles. Everything is too accessible, too connected, to the extent that there are people somewhere in the world connecting their toasters to their Wi-Fi's, and those who are probably reading about it on their Twitter-feed reading microwaves. This leads us back to the question: are we as passionate? The answer is probably pretty obvious. Having a passion is probably the same across all human cultures. 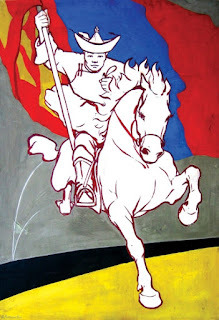 The question is whether Mongolians live in a society where pursuing one's passion is possible, encouraged or feasible. Perhaps it has to do with the various developmental stages a society has to go through before the pursuit of passion and happiness become the obvious thing to do, i.e. Maslow's hierarchy of needs. As the theory goes, one must go from the bottom up, i.e. satisfy the basic needs before we focus on those higher up. We are somewhere at the bottom and should be more worried about the physiological and safety needs. We, as a society, are not even half-way up the pyramid of needs yet. However, for the young and urban Mongolians, their needs are quite different. As individuals, they are heading up the pyramid of needs towards esteem and perhaps, for some, self-actualization. This is, in large part, due to the rise of technology that made the world a smaller place. Technology makes, sometimes deceptively, goals seem more possible. We feel like we know more, because Google does. We feel like we could know everything, if we wanted to, and had reception on our devices. Knowledge has become an external thing that we access when required, and not something that necessarily needs to be internalized. Why know anything, when you could know everything. I guess the point, if there ever was one, I am trying to make is that we have skipped over the fundamental bits of progress. Mainly because progress has become too fast. I was watching the news the other day, which already indicates the age group to which I belong. 33,000 graduates will soon be competing for 10,000 jobs. We have produced too many lawyers and not enough school and kindergarten teachers, too many economists and businessmen and not enough civil engineers and child psychologists. The image included above is of a famous Communist era painting that was proudly captioned "Skipping capitalism, straight to socialism", an iconic image for most Mongolians of my generation. The same image still applies to us today. It could represent the discord and disconnection between the left-behinds and the go-forwards of our society. Or it could represent our unquenchable desire to walk hand-in-hand with progress, leaping over the necessary developmental stages, whatever the consequences. A journalist friend of mine informed me of this. 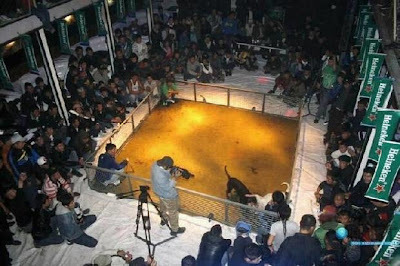 Photos from 2010 of a dogfight with Heineken banners plastered around the venue has recently gone viral on Facebook, with consumers threatening to boycott Heineken products. The photos are from a 2010 dogfight "championship" organized by a pit bull terrier breeders' club at a UB nightclub called Elite. According to the site that originally posted the photos, the breeders' club has been organizing these "official" fights since 1997. (source here. be warned though, graphic images of animal cruelty). The company claims to have removed all promotional materials from the venue and ceased relationship with the nightclub since the incident came to light. I have not been able to find any information on laws prohibiting such activities and according to friends, dogfights are not illegal, i.e. nobody's bothered to address it so far. These events are most likely low-key and never publicized, as I have never heard of this before yesterday. Asian Gypsy blog is a bits'n'pieces blog on things ranging from Mongolian to mundane. Published sporadically, infrequently and sometimes half-baked.